Keep your device charged with the Mophie powerstation plus 3X 5000mAh Battery Pack. This battery pack features an integrated USB charging cable as well as a Lightning connector, making it easy to charge Lightning-enabled devices on the go. The powerstation plus 3X's 5000mAh battery allows you to triple the battery life of most smartphones, and the hinged top cover hides the internal cables when not in use. 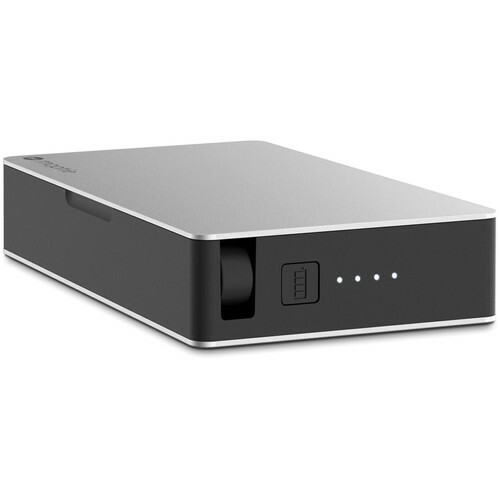 The powerstation plus' lithium-polymer battery is rechargeable for over 500 charge cycles. Its pass-through charging technology allows you to connect your device while your powerstation plus is charging, so you can charge and sync without having to disconnect the battery pack. The battery pack features an aerospace-grade aluminum exterior and four LED lights that indicate battery status and charge level. Box Dimensions (LxWxH) 7.0 x 4.3 x 1.2"
powerstation plus 3X 5000mAh Battery Pack (Lightning) is rated 5.0 out of 5 by 1. Rated 5 out of 5 by Andrew W. from Simple and Convenient Back-up Power We use this as back-up power for both our iPhones and iPad Airs. Note that this unit has a lightning connector, so it is very convenient for Apple devices - No extra cords to carry and it is very compact and self-contained.